On September 16, 1868, a devastating fire in Barkerville spread quickly through the town’s compliment of wooden buildings, shingled roofs, and canvas ceilings to almost completely devour what had by then become the centre of British Columbia’s economic activity. With the harshness of winter fast approaching, those industrious and persistent Barkerville pioneers struck back in the face of misfortune. Reconstruction began two days later, at an impressive pace. Within six weeks, ninety buildings had been rebuilt, the town’s boardwalks were improved, and Barkerville’s previously narrow and winding main street was both widened and straightened. 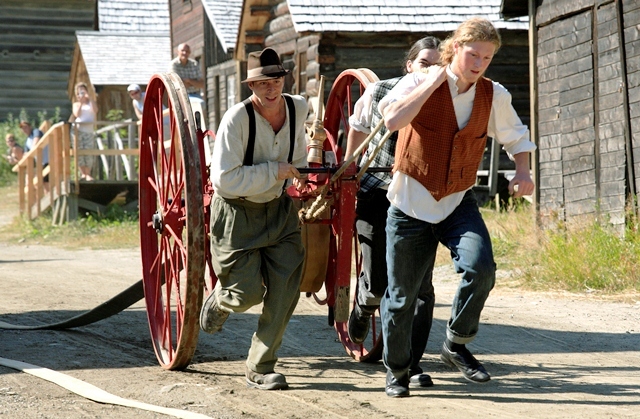 Any BC firefighter visiting Barkerville from now until September 26th, 2010, will receive a free family admission pass when he or she presents valid identification. In addition, Saturday, September 18th – 142 years to the day that Barkerville’s rebuilding began – is now officially Williams Creek Fire Brigade Day at Barkerville. Fire Brigade-themed games and activities are planned for the general public on Saturday afternoon, including an Amazing Race-style relay to “help rebuild Barkerville,” and a special “Fire Brigade Follies” edition of the Theatre Royal’s fall season show “Gold Rush Nuggets,” at both 1 pm and 7 pm. Members of the Wells Volunteer Fire Brigade will be on hand throughout the day to show off their skills and equipment, and to answer any questions guests may have about modern ways to keep valuable resources like Barkerville Historic Town safe from seasonal wildfires. The fast arrival of fresh lumber played a critical part in the recovery of Barkerville after the Great Fire of 1868. Thanks to the funding from the Federal Government’s Western Economic Diversification initiatives, and the restoration efforts of the Quesnel Antique Machinery Park, visitors to Barkerville during Williams Creek Fire Brigade Day on September 18th will also have a rare opportunity to witness the revival of Barkerville’s 1868 Waterous Engine Works sawmill. The refurbished “rack and pinion” sawmill will be fired up at the machinery shed on Barkerville’s back street at 2:30 pm. Come visit Barkerville Historic Town on September 18th – Williams Creek Fire Brigade Day – and help honour the efforts of those who continue to keep our province safe from fire while enjoying a beautiful autumn afternoon filled with fun, firefighter-themed activities. The novel I’m working on now, a sequel to “Partners”, will include a description of the ’68 fire, how it started and how the town “exploded” from the ashes. That is, if I ever get it finished.